I admit it; I love survival reality shows. 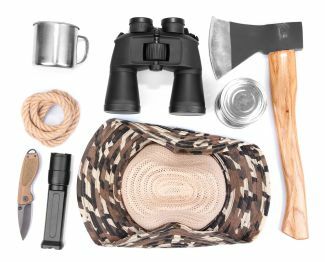 It started with “Survivorman,” then “Naked Castaway,” and “Dude, You’re Screwed.” Whether it’s a man alone in the wild with only a few survival items or a commando-type guy kidnapped by his commando-type friends and dropped off someplace remote, if someone’s trying to survive in the wild, I’m going to be interested. In one survival show, two strangers are dropped off in an inhospitable locale to survive for 21 days. They have nothing on them (not even clothes), but they’re each allowed to bring one survival item. Popular items are a firestarting tool, a knife, and a bowl. With these three tools, you can cover the basics: build a shelter, build a fire for warmth and to cook food and boil water, and hold the water while it boils. Take one of these items away, and you’re missing one of the necessities of food, water, and shelter. Each couple has to make a choice of which necessity to leave to chance. Fortunately, you don’t have to leave anything to chance when you’re documenting your business deal. But if you could protect yourself with only two provisions, what would they be? Of course, every contract has to describe the basic business terms such as price and quantity in order for the contract to be enforceable. But what two other terms would you choose? When I’m representing buyers, my principal concern is making sure my clients get what they’re paying for. So I’m usually concerned that the product or service is adequately described in the contract and that the seller provides a warranty that the product or service will conform to the description. When I’m representing sellers, my principal concerns are making sure my clients get paid and that the business deal doesn’t leave them exposed to undue levels of legal and business risk. So I’ll want to make sure there’s a good clause in the agreement describing how much the seller will be paid and what triggers the payment obligation. I’ll also want a provision that limits my client’s exposure to legal claims. I’m torn between limiting the warranty coverage and a limitation of liability provision, and I’d probably make that determination on a case-by-case basis. If forced to make a universal decision, I’d probably include a dollar cap on liability to the price of the product or service. Of course, in the wild, this is often a hotly-contested issue. In the real world, you’re not going to be limited to choosing just a couple of contract clauses. But negotiations do often require giving up one thing in order to get another. So it’s a useful exercise to think about what the most important clauses are. If you were forced to choose only two contract clauses, which would you choose? 1. Non-reliance on representations outside the contract. 2. (TIE:) Choice of law | damages cap | arbitration, probably in that order. D.C. and Elie: Would your answer be different if the likely amount in controversy were, say, $50,000 vs. $1 million? Yes, 100%. But, I want to come at it from the legal side. By that, I mean that the clauses you chose above, while certainly carrying extensive legal ramifications, may also be described (at least the second example) as heavily influenced by the business side of the deal. Obviously, the legal and business sides go hand in hand but, in my mind, when the payments are made and what triggers them are more business oriented than legal. 2) I either want the right to be able to amend my pricing w/o notice if the law of the land changes and puts me in a position where I need to do so in order not to lose money. But, that’s only b/c of the industry I’m in. If I was still back in the cell phone towers industry, I think I’d want an indemnification as well and swap out the second point above. So, let me ask you another question. How many clauses in a contract do you consider to be purely “legal?” Meaning you, as the attorney, have final say (or should have final say) to override the business people? Venue, indemnity, choice of law….? What else, really? My experience is that most contract disputes begin (and all involve) practical misunderstandings, lack of communication or oversights. Despite this, the brain surgeon self-image typical of of most professions, makes lawyers and judges proselytise about technical legal issues being at the core of disputes. However, in responding to the article’s question, I would prioritise recitals as typically indispensable. In doing so I would argue that this article’s question should be expanded to ask – what clause or other structural element of a written contract stands out as being very useful. I accept a recital at law is not a clause. •	what facts, events and communications led to the agreement? •	what are the interests of each party affected by the transaction? •	what is the purpose, scope and intended outcome of the agreement? •	what does each party bring to the table? •	what are the key risks, issues and problems? •	what approach should be taken to the transaction? Noric: I agree with your premise that protecting legal rights isn’t the only role of a contract. You might be interested in my post Contracting Triage where I posit a few different purposes of contracts.